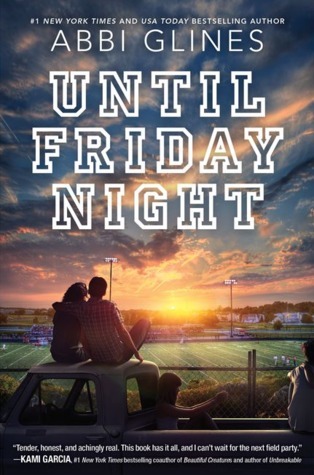 I would like to thank the publisher for providing me with an ARC of Until Friday Night for review. Abbi did not disappoint with this first book in a new series. Until Friday Night was emotional, heartbreaking and healing. The characters where so accurate to how a teen dealing with these traumatic issues would most likely behave. Abbi perfectly portrayed how they are teens still learning how to become mature adults and aren’t there yet, they are going to stumble many times to get there especially if they are going through something they feel unprepared to handle. I loved the portrayal, it was accurate. Maggie has gone through something very traumatic and doesn’t want to talk to anybody about it, she has become mute. She is now moving in with her Aunt, Uncle and cousin Brady. Her family has been torn apart and she has a long way to go before she can piece herself back together and heal. She feels the only way to deal with the pain she has experienced is to not talk to anyone then she doesn’t have to talk about what has happened. It is how Maggie has coped. West is Brady’s best friend, he is on the football team, and he is popular. West has a deserved reputation with the ladies. He doesn’t want anything serious, he is dealing with so much in his life that he looks at girls as a way to numb the pain, and not think for awhile. He doesn’t want anyone including his friends to see what he is really dealing with or the real him. West doesn’t feel like a good person or like he can deal with more in his life. West and all the other boys in school think Maggie is hot, but Brady has warned them she is off limits. West and Nash both have a hard time listening to Brady. Maggie just wants not to feel lonely and doesn’t want Brady to hate her, by disrupting his life. One night West decides to stop fighting his silence about what is going on in his life. He talks to the one person he knows won’t tell anyone else, Maggie. He knows Maggie has been through something bad too, but he wants her to open up. Soon Maggie gives him what he needs, and he learns the truth about her experiences. They share a strong bond and West is determined to not lose this friendship. Can Maggie and West remain friends with all these secrets? Will stronger feelings develop and rip them apart? Can they really trust each other to keep their secrets? You have to read this book to find out. I absolutely loved this emotional, fun, and romantic novel. I cannot wait to continue the series and see what other characters are dealing with, especially the cousin and best-friend Brady. I am giving this book 5 out of 5 stars.